Zandra Rhodes is the first fashion designer I became aware of as a child. I think I must have been 10 or 12 when I saw a picture of her in a magazine. I was captivated by her pink hair. I had never imagined that grown-ups could look like her. Certainly none of the mums in my neighbourhood did. I was also drawn to her clothes – long, flowing and bright. When an aunt sent me a colourful chiffon ‘butterfly’ top from Fiji I was in heaven. I flitted about channelling Zandra and dreaming of the day I could have pink hair. As a grown-up I’ve never pursued the pink hair, but have remained a Zandra Rhodes fan. 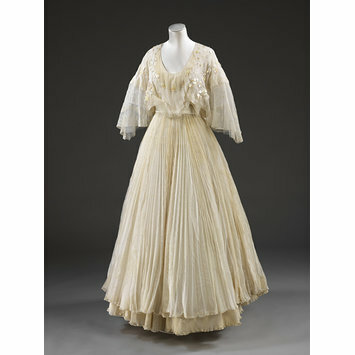 As such I was delighted to see her name on the list of designers for Unveiled: 200 Years of Wedding Dress from the Victoria and Albert Museum, London. While Zandra Rhodes is renowned for her dynamic and skilled use of colour – musician Brian Eno speaks of her bringing ‘dashes’ of Matisse to the fashion world – the Zandra Rhodes wedding dress in Unveiled is an exercise is sublty. It is rendered in the palest of tones, white on white with a hint of creamy yellow. The dress, I think, is simply the prettiest in the exhibition. In 1973 Rhodes launched ’73/44′ – a very feminine printed chiffon dress characterised by a deep V neck, full skirt and satin sash. She has reinterpreted this popular design throughout her career. Despite its more demure and rounded neckline, this wedding dress from 1976 bears many of the characteristics that made 73/44 a hit. Invoking of a location far from London, Rhodes has printed the silk chiffon with a pattern of waves and fronded palms. She has cleverly reflected the movement and structure of the latter in the structure of the dress – in the pleating of the bodice and skirt and the undulating frills around the waist. 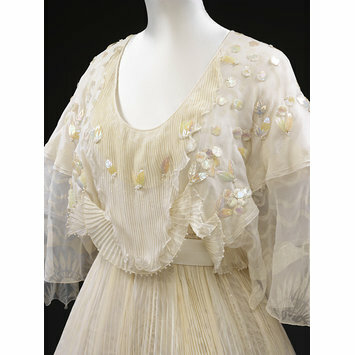 Decorated with tiny pearls, and irrisdecent, tinted flowers and leaf shapes, the dress seems made for a sea nymph. Rhodes trained as a textile designer rather than a fashion designer. She studied at the Royal College of Art in the early 1960s. After graduating Rhodes worked as freelance textile designer. Concluding that no one worked as well with her prints as she did, she launched her first clothing collection in 1969 (fashion was in her blood – her mother had been a fitter at Worth and was a lecturer in fashion). Today, textile design remains Rhodes ‘metier first and foremost’. The wedding dress was commissioned by another budding fashion designer, who at the time was studying as the Royal College of Art. Her name was Elizabeth Weiner. 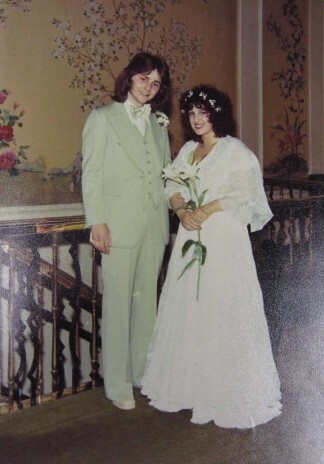 Her fiancé was fellow fashion student, David Emanuel, who chose a soft green suit to compliment his bride. David and Elizabeth Emanuel on their wedding day. Photograph courtesy of Elizabeth Emanuel. In 1981, the Emanuels shot to international fame, when they were chosen to design Lady Diana Spencer’s wedding gown for her marriage to Prince Charles. Elizabeth Emanuel is still designing, and recently represented England at Style Pasifika in Auckland during the 2011 Rugby World Cup celebrations. She spoke to Breakfast TV while she was in New Zealand about designing for Lady Diana and about designing a Style Pasifika gown inspired by the All Blacks.